Parakeets and other small parrots are so much fun to have as pets. And what's more they know they're fun! In a pet store the other day, I happened to see a conure playing with this bowling ball toy and I want to say that both the conure and I were laughing out loud. 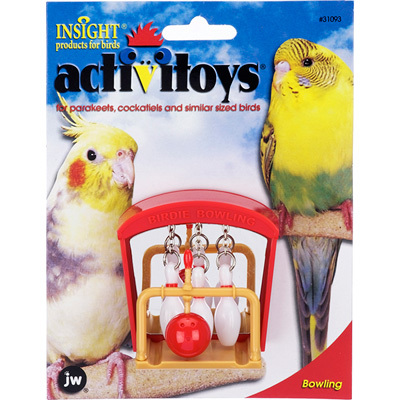 The toy is called the Birdie Bowling Bird Toy and it can be 'operated' by any of the smaller birds up to about cockatiel size. They don't always 'bowl' with it though. Aside from picking up the ball and dropping it, they also do that with the pins, which they move around from the top while they hang over the side. All the time, watching themselves in the mirrored surface of the toy! It is a puzzle trying to figure out why the pins in the mirror are doing the exact opposite of what he's doing, but your bird will love trying! 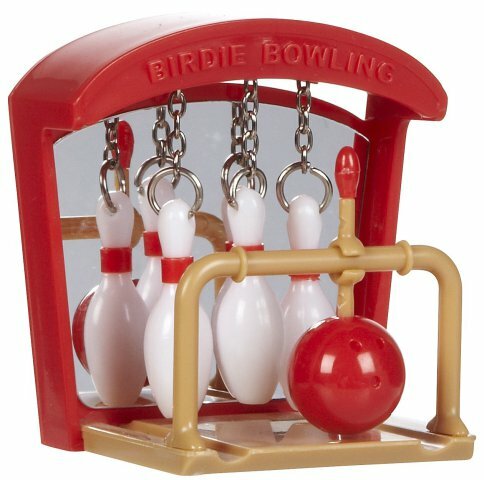 You can dind the Birdie Bowling Bird Toy here.